Perhaps the age of conforming has worn out its welcome. For an extended period of time, we’ve chosen a path that encourages and fosters self-control, discipline, developed skills and acceptable behavior. Where has that really gotten us … really?! Perhaps for a time, it served us well after the free-spirited 70’s but I wonder how well it’s serving us now. Pinocchio comes to mind as I ponder the changes that are beckoning us all to release the strings that keep us tied to old ways. Pinocchio may best be remembered as the puppet with the nose that grew when he was caught lying, but there’s another dimension to the story of Pinocchio. Pinocchio showed him otherwise. 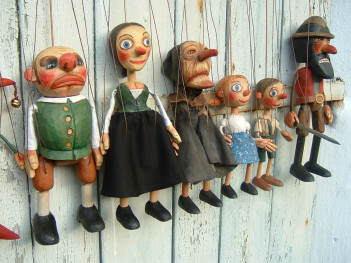 Pinocchio was not going to be tied down to strings and suggestions. Pinocchio was not going to conform to someone else’s idea. He wanted to be a free spirit; he wanted to be a “Real boy”. Does this sound like anyone you know? Do you know anyone who is at a place in their life where they have been groomed, fashioned and conditioned to believe, behave or act a certain way to fit into someone else’s vision? How is that serving them or … you? Is it really ok to think differently? Is it really ok to honor and recognize your misery about where you are in life? Is it really ok to be aware that what used to bring you happiness and fulfillment is not really working anymore? You already know that we cannot go back, so how do we move forward? The things that used to be of significant importance are no longer carrying that hypnotic flame that keeps us content. If where we are is no longer serving us, then where do we go from here? If our identity has been wrapped up in our lives as spouses, parents, caregivers, our career or our activities and they are fraying at the seams, then where do we go from here? What does your heart say? It has been speaking to you this entire time and it has something delightful, inspiring and comforting to share with you. If you have not heard its quiet whispers, then perhaps it’s time to sit and listen. If our hearts are the direct link to the Divine Spirit and we trust that Divine Spirit to lead and guide us in this life, then our hearts are where we have the power to listen. It truly is the one activity that we possess that no one can jeopardize, take away, steel in our sleep or abolish and destroy. What are my gifts? What have I been blessed with that is a loving, full expression of me? What do I enjoy doing so much so, that time passes by and I’m not aware of it? If money were never a concern, what would I do for free? What brings me joy … GREAT joy? Who do I enjoy spending the most time with? Now, before you decide that these things don’t matter because you cannot make a living doing them, let me interject another thought. I don’t know if you know this but, Corporate America is crumbling. Companies that used to have a solid foundation with good, moral principles, devoted employees and happy customers, are dissolving. These are careers that were the crowning glory of a college education with a line of degree’s to show for it. What used to be a desired and acceptable career path is changing and a new way of thinking and believing is emerging. We used to think that a college education that segued into a career was the noble and honorable thing to do. Technology, innovation and creativity are emerging. People are making money now doing the very thing that brings them joy. We can do that now because old ways are dissolving and new ways have captured our interest. People are now making money by simply selling ideas …. Seriously! With the internet and social media, information travels from one side of the globe to the other in a single breath! So when you discover what you truly love, when you discover what your heart wants to share with you about what brings you joy, I promise you, there is a way to share that with the world and … make money. So, allow yourself to slowly detach your puppet strings so you can move, dance and celebrate your life. Give the puppeteer permission to go about their business controlling their puppets while you start charting the course to that thing that moves your soul. It’s time and I can say that because you have read all the way through this article, you’ve felt the pains of life and you know that something bigger and better is beckoning you to reach, grab and GO! You are no longer a puppet. You’re a “Real boy”, and it’s time for you to experience a new life. Beautiful Noel, when are we going to do coffee?